Because of all the changes taking place on LinkedIn, people are frequently asking me what they should be doing each day for maximum LinkedIn success. So today I’m going to give you a 15-minute daily to do list. If you want more help with time management on LinkedIn, you can find many of these daily ideas—along with weekly, monthly and quarterly to do lists—in one of the most popular chapters in my book, Ready…Set…Go: A Six-Week, Two-Hour-Per-Week Roadmap to Results. These four critical steps should take you no more than 15 minutes—and if completed consistently, they should bring you quantifiable LinkedIn results. 1. Review Who’s Viewed Your Profile and reach out to the people you should be meeting (3 minutes). Viewing your profile is the equivalent of walking into your store, so be sure to reach out and ask the person how you might be able to help him or her. This feature has some limits, depending on your personal settings and if you’re paying for a premium account or not. Check out this article for a full discussion. 2. Send invitations to join your LinkedIn network, using a custom invitation, to people you met (in person or on the phone) since the last time you sent out outbound invitations (5 minutes). Making this part of your networking process or routine will help you in many different ways on LinkedIn. To get the inside scoop on adding gas (connections) to your LinkedIn tank, be sure to download a copy of my free article The LinkedIn Connection Conundrum: Who Should be in Your Network. 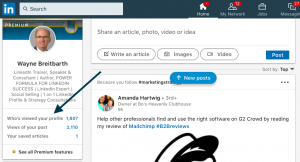 Improving your search ranking on LinkedIn is all about connections, especially the right ones, and people you have already met are spot on. 3. Review all the important information in your Notifications Tab (4 minutes). This tab on the new LinkedIn desktop is awesome. It puts all the most relevant information about you and your connections in one convenient place. For a deeper discussion of this feature, check out this articleon the Notifications tab. 4. Take time to review all of your inbound invitations to connect (3 minutes). That’s right—take a little time. Don’t just quickly click Accept or Ignore. My suggestion is to first read all the messages that people took the time to write in their connection request and respond accordingly. Also, look at the profiles of the people you may want to follow up with, looking for areas of commonality or opportunity. Remember—these people took the first step, and it’s your job to figure out what the next step should or could be. Of course, there will be people who attempt to connect with you that are probably spammers and others whom you simply see no reason to have them in your network. Don’t hesitate to click Ignore in these cases. Make sure you find 15 minutes in your day to accomplish these four tasks, because it will undoubtedly lead to new and deeper relationships with people who can significantly impact your professional career.